If you use Defraggler to defragment your free space, you can select this option to leave large files untouched. Why would I do this? When Defraggler defrags the free space on your drive, it does so to optimize the free space -- and it may end up moving large files around in the process. If you've used Defraggler previously to optimize the drive by setting it to move large files to the end of it, your optimizations may be undone. The solution is to let Defraggler know you don't want it to move large files during free space defragmentation. In Defraggler, click Settings, and then click Options. On the Options dialog box, click the Defrag tab. Be sure the Move large files to the end of drive during whole drive defrag is selected. 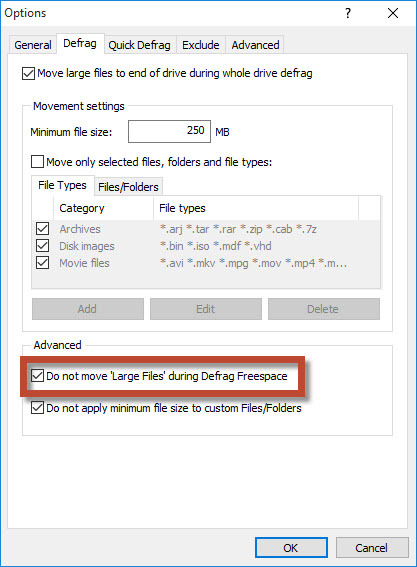 Select Do not move 'Large Files' during Defrag Freespace. Note: Defraggler will use the number in the Minimum file size box to determine which files to leave alone during free space defrag.